I’ve always wanted to dye my hair in bright hues, especially since the recent trends of unicorn and galaxy hair colours. But at the same time I’ve always worried about how dry and hard to maintain my hair would be after such hair treatments. 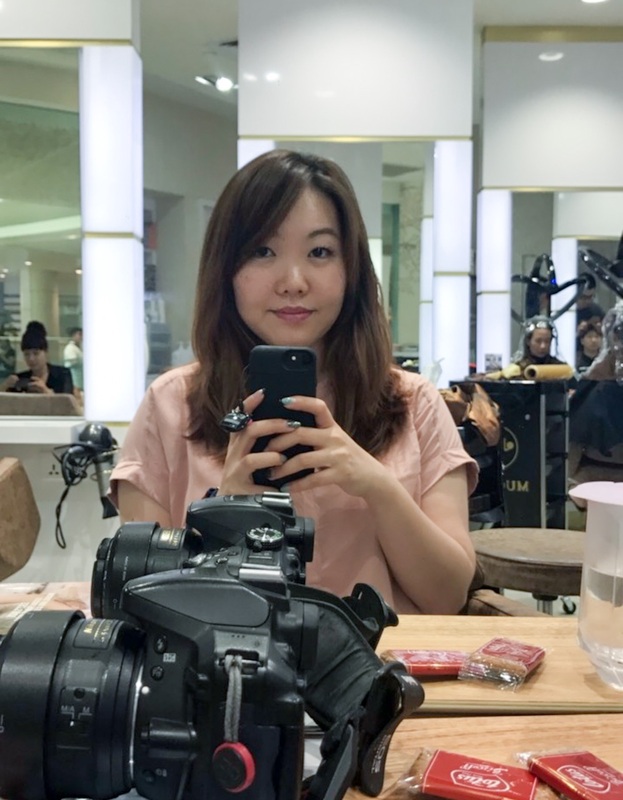 Recently I got the chance to experience a brighter hair colour shade thanks to Kenjo Salon and I didn’t have any qualms about going through with it after seeing the hair colour Kenjo had done for my friends. 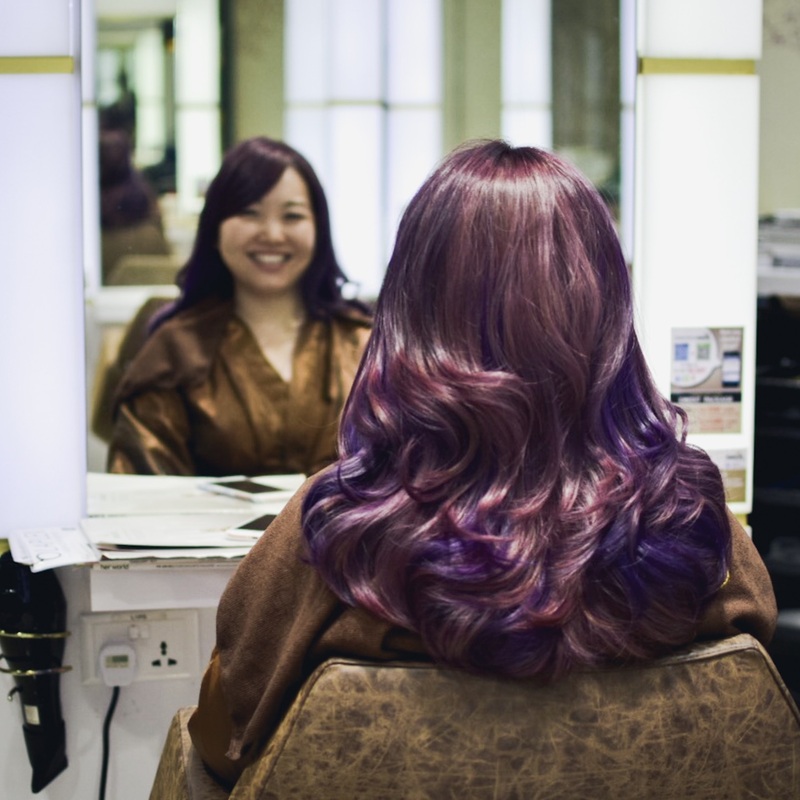 When I arrived at the salon, my stylist William examined my hair and asked what I’d like to do with my hair. From there he started to explain what can be done or not done due to my hair texture and previous chemical treatments I had done in the past year (perming). We decided to go ahead with bleaching and colouring my hair. Bleaching?! Everyone always says how dry and frizzy their hair is after bleaching don’t they? 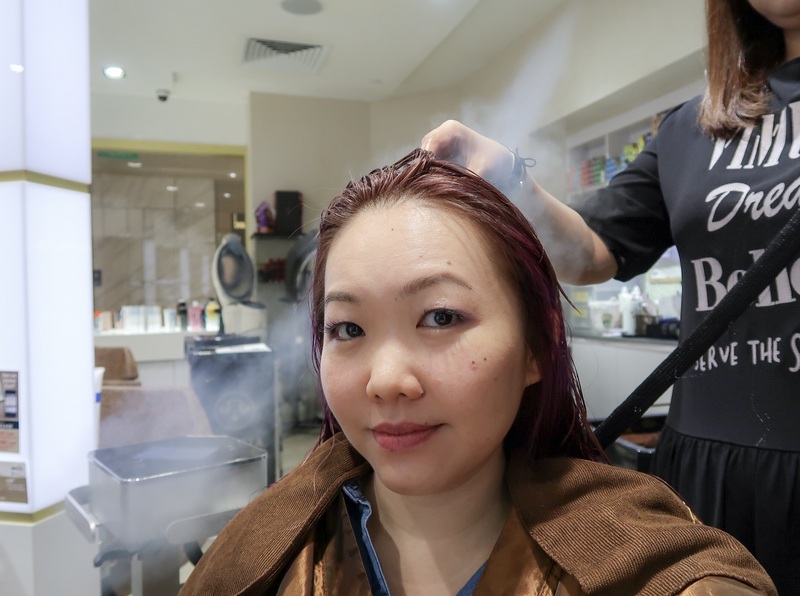 However, at Kenjo Salon they explained how they use the hair treatment ‘Olaplex‘ in the process. — In technical terms, Olaplex is a bond multipier that links broken disulfide bonds in the hair to restore strength and structure. What?! — In basic terms, Olaplex helps to eliminate breakage of hair during bleaching, maintains longer lasting hair colour, improves elasticity, plus helps to restore strength to your hair. Olaplex was added into the bleach chemicals as a treatment and stylist William also chooses to use Davines bleach because it’s a gradual bleaching process and less harmful to hair. Kenjo is very careful with the chemical treatments used in-house and will advise if they think a treatment will not be suitable. This leaves me with peace of mind knowing they take care of my hair through every step. After inspecting of my hair after the bleach, we discussed if I’d coloured my own hair before. Which I have been for the past year. My stylist pointed out that although it’s ok to do this, when it comes to returning to salon services for hair colouring, the hair colour would be patchy and mine was obvious after the bleaching. So… if you’re thinking of colouring your hair at the salon, it’s best not to colour it yourself at home. Then the colouring process started. My hair would be a mix of Violet and a custom pinkish-gold colour mixed by William. This seemed like a really long and tiring process for the stylist as the colour was rubbed into the hair section by section. Plus my hair is not short, so it took awhile to complete the colour application. Once the colour application, waiting time and wash was done… Bam! 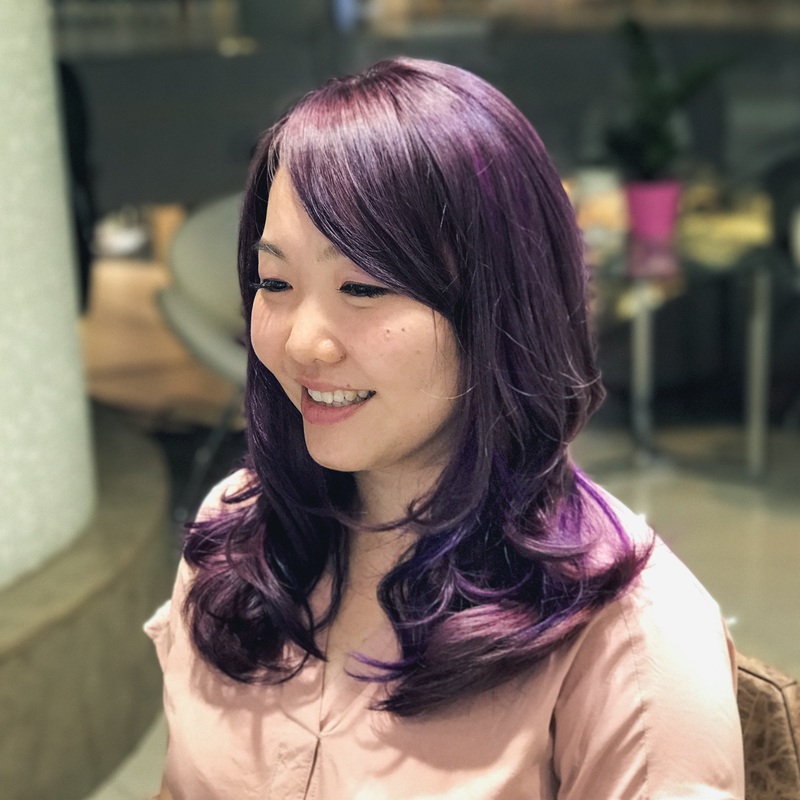 My hair was dramatically new, vibrant and violet! I couldn’t believe the colour turned out so rich and the play between the violet and pinks were definitely eye-catching! I was told that they wouldn’t perm my hair again because it would be too damaging as I’d just done a bleach and colour. However, my perms from previously were still present and with a little bit of brush techniques and blow drying, my bouncy curls were back. The most amazing part was that my hair didn’t feel dry at all—which was what I was most worried about doing a bleach and colour. My hair was still glossy and smooth which made me fall in love with the colour and treatment even more. The week after colouring my hair, Kenjo Salon invited me back for a hair treatment as their team was having a training day for Tokio Inkarami hair treatment. From this day, it was evident that all the stylists at Kenjo put in their best efforts to learn about new products and they asked a lot of questions during the training to understand the treatment fully. 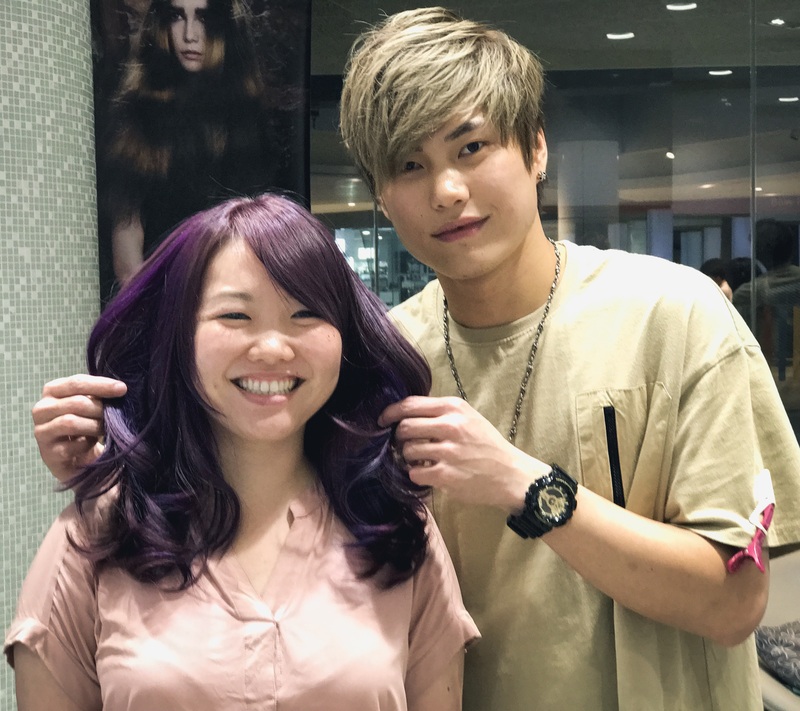 During the session, the hair stylists even went around to observe the hair treatment being performed on others so that they could ensure they were using the products correctly. 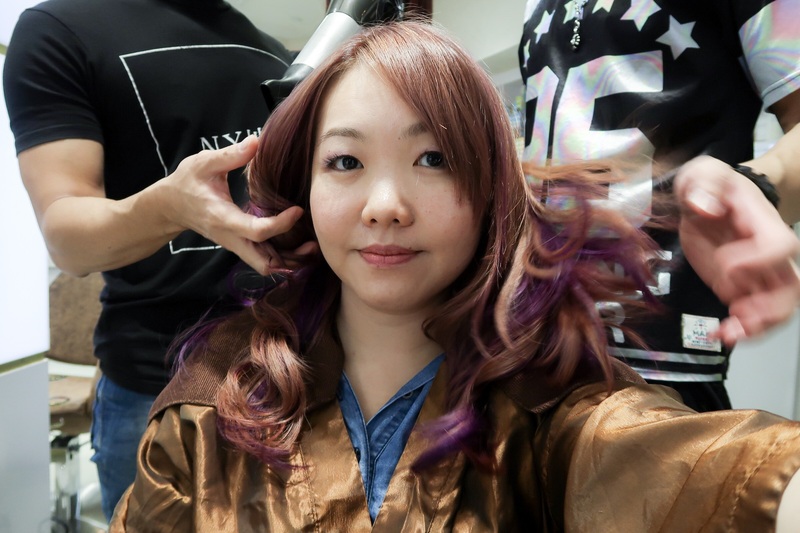 The treatment feels like it’s a lot of work for the stylists as they have to massage in the treatments, wash and steam the hair multiple times between each step. But the end results were amazing! My hair felt more smooth and softer than before I even bleached and coloured my hair! I highly recommend this treatment if you have a couple of hours to spare. There’s a number of steps, but the results definitely speak for themselves. Even in the photos it’s evident that my hair is much smoother. To maintain the hair texture and continue rebuilding the hair from within, there’s a home treatment system called Tokio IE. Kenjo Salon retails these products which consists of Shampoo, Conditioner and Treatment Oil for day to day use. I’ve been using these products for the past few weeks and my soft hair has maintained. I don’t get any hair tangles and my hair is so smooth I really don’t need to even brush it. I do use a heated hair curler almost everyday, and even with all the heat and styling, my hair’s managed to stay silky! Mention my name ‘GeekyElephant’ when you book your appointment to enjoy 15% off your first visit to Kenjo Salon! Bring your mum in for hair services at 50% off at Kenjo. Plus enjoy 15% off your own hair treatments! 0 Comments on "Kenjo Salon: Colour treatment experience"